Headquarters Co "A", 7th Iowa Cavalry Past Alkali N.T. March 10th 1865. To His Excellency Wm M. Stone, Governor of Iowa Sir:- Having been officially notified that my Second Lieutenant had been promoted to Assistant Adjutant General with the rank of Captain United States Volunteers, I forwarded a recommendation to Adjutant General Baker; for Sergeant Major Thomas J. Potter 7th Iowa Cavalry, to fill the vacancy, encloseing him an official copy of the muster-out roll of Second Lieutenant Roberts. 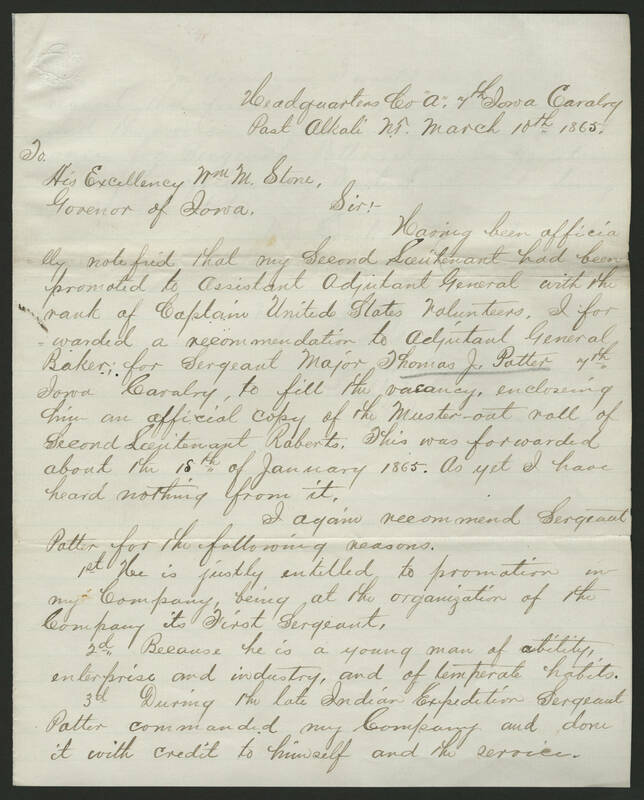 This was forwarded about the 15th of January 1865. As yet I have heard nothing from it. I again recommend Sergeant Potter for the following reasons. 1st He is justly entitled to promotion in my Company, being at the organization of this Company its First Sergeant, 2d Because he is a young man of ability, enterprise and industry, and of temperate habits. 3d During the late Indian Expedition Sergeant Potter commanded my Company and done it with credit to himself and the service.